The 4th installment of the Date Shark Series is finally here! So if you got a new Kindle for the holidays and need some books to fill it…SHARK IN TROUBLED WATERS is now live, and you can read the entire Date Shark Series FREE on Kindle Unlimited. Don’t forget to grab copies of the rest of the series as well! 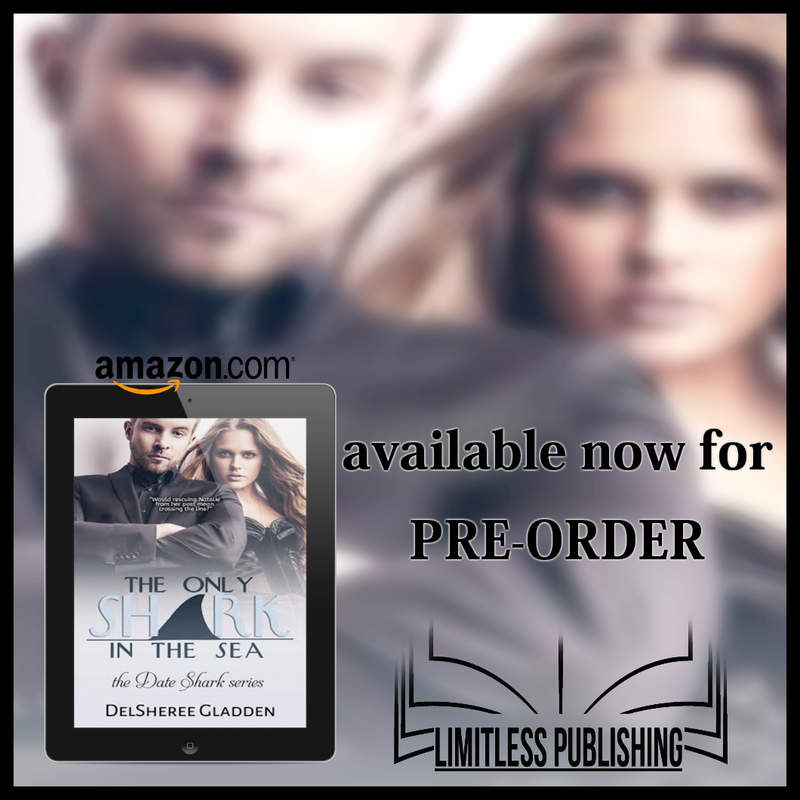 THE ONLY SHARK IN THE SEA IS NOW AVAILABLE FOR PRE-ORDER!!! I just got the final copy of the cover art for THE ONLY SHARK IN THE SEA and I’m so excited to share it!!! 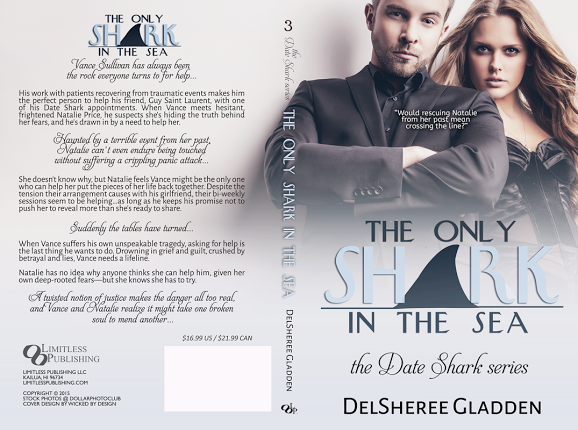 I’m setting up a cover reveal for September 8th, 2015, and if you’re willing to help me share the artwork and news about the upcoming release of the third Date Shark Series book, I’d love to have your support! I’m doing this a little differently, though. This cover reveal isn’t exclusive to bloggers. I’m opening it up to anyone willing to share on any social media platforms they use, so don’t be afraid to sign up if you’re not a blogger! Check out the form below and check back on Sept. 8th for a look at the fabulous cover art for The Only Shark In The Sea! Yes, I’m talking about the Date Shark Series again because that has been my entire writing world for the last 6 weeks or so. Book 3 – The Only Shark In The Sea – was sent to my publisher for editing last week and book 4 – Shark In Troubled Waters – was sent out to beta readers Monday, so both should be out before the end of the year. Exciting! 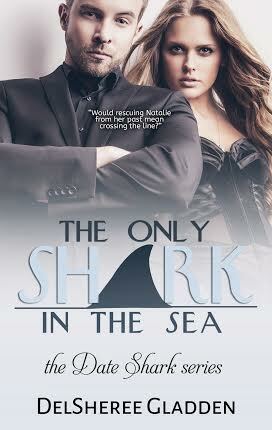 For now, how about some teasers from The Only Shark In The Sea, featuring Vance Sullivan and Natalie Price. Feel free to share, pin, or tweet! Enter to WIN ebook copies of all 3 books in the series HERE. After taking some time away from the blog last week due to being sick and having a ton of stuff to do to get ready for a trip to Denver Comic Con this weekend, I have some updates for everyone on the Date Shark Series. Book 3, “The Only Shark In The Sea,” is currently out to beta readers and early responses have been very helpful and overall happily positive! 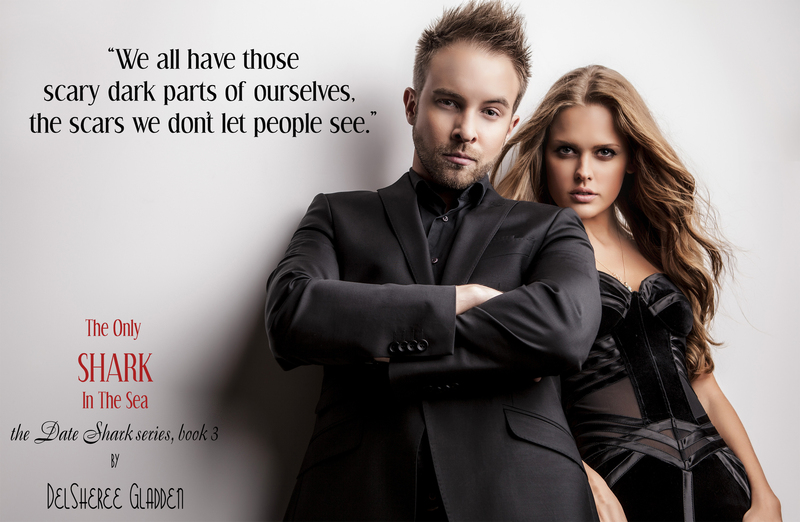 If you’d like a little sneak peek at Vance and Natalie’s story, check out an excerpt here on Bestselling Reads: Focus Friday. I probably won’t have a cover or release date until sometime in June once I send revisions to my editor/publisher, but I thought we might as well get in the Date Shark spirit and have a little fun with the idea behind this series. So it’s time to have a CONTEST!!! 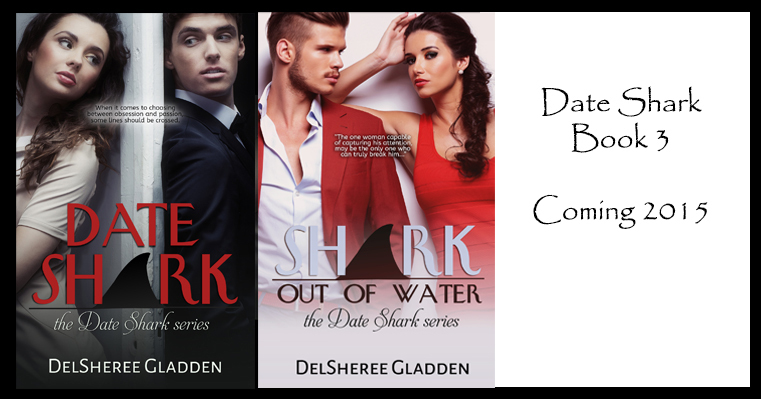 Comment below with your worst date story (feel free to leave out names if you so choose) and you’ll be entered to win an ebook bundle of all 3 Date Shark books PLUS a $10 Amazon Gift Card. 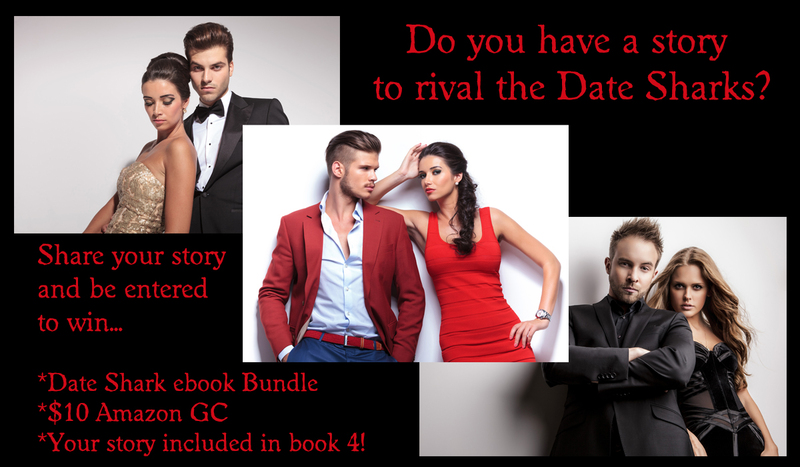 And as a bonus, if you are willing, your bad date story could be included in the fourth book in the series! 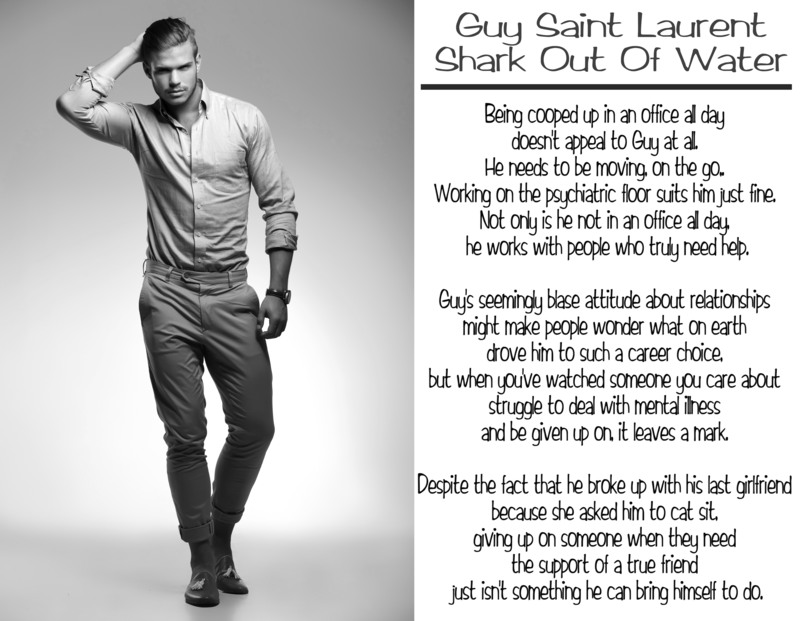 Guy Saint Laurent from Date Shark #2, Shark Out of Water, is up for Hottest Guy in the 2015 Romance blogfest! Pop over, check out all the guys, and VOTE FOR GUY! Or if you’re willing to review on Amazon and Goodreads, send me a message about getting a free review copy of any of the Date Shark books or my other books. Draft One: Check! Date Shark 3 is on it’s way! 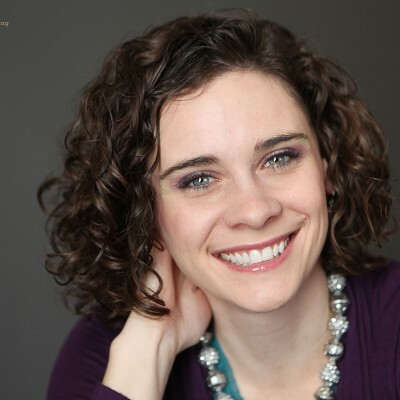 Since deciding to begin the process of selling a house, buying a new one, and all the craziness that goes on in between those two things and immediately after, I really haven’t done much writing since January. My focus was on keeping the house clean and packing. If you’d care to meet the stars, Vance Sullivan and Natalie Price, I just so happen to be able to make that happen! I will admit that this story kind of veered off from what I initially intended it to be, and that took me places I wasn’t expecting, which leaves me a little hesitant to send it off to my beta readers because I honestly don’t know what their responses will be to certain aspects of the story. It probably holds some of the most controversial topics I’ve ever discussed in one of my books and doesn’t fade to black on one intimate seen, though I kept the prose focused on the thoughts and emotions rather than vivid descriptions. I’m nervous, and I’ll just have to wait to see what will happen. Until then, here’s a short excerpt for your consideration. Natalie shook her head, knowing he wasn’t being completely honest, but he spoke over her silent objections. Natalie used to believe she was the first two, the last she wasn’t so sure about at all, but… “Beautiful?” she whispered. The feeling of her chest constricting was all too familiar, but the absence of panic to induce the feeling was startling. The warmth she felt touching him the night before fluttered back into her mind like a temptation. It was one thing to make accidental contact when he was asleep. Touching him, or letting him touch her, she couldn’t bring herself to do it no matter how much she wanted to feel that feeling again in that moment. He wanted it too, she realized. It was a frightening realization, and she almost pulled back from instinctual fear. Vance had admitted it in a way a few minutes earlier, but he had been talking about comforting her. Calling her beautiful…she didn’t know if that changed his reason for wanting to touch her. It was right there in his eyes, though. All it would take was her making the first move, telling him it was okay. Desperation to feel his skin against hers almost literally took her breath away, she wanted it so badly, but she couldn’t. She hated herself for her weakness, but there was no way around it as she lay face to face with him, the gap of less than a foot of space between them an uncrossable distance.